It is often useful to think of the future as having two distinct parts: the short run and the long run. These are not precise time periods. 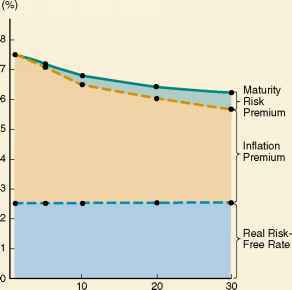 The distinction has to do with whether costs are fixed or variable. In the long run, all business costs are variable. Given sufficient time, assets can be sold, debts can be paid, and so on. If our time horizon is relatively short, however, some costs are effectively fixed— they must be paid no matter what (property taxes, for example). Other costs such as wages to laborers and payments to suppliers are still variable. As a result, even in the short run, the firm can vary its output level by varying expenditures in these areas. The distinction between fixed and variable costs is important, at times, to the financial manager, but the way costs are reported on the income statement is not a good guide as to which costs are which. The reason is that, in practice, accountants tend to classify costs as either product costs or period costs. 2By "straight-line," we mean that the depreciation deduction is the same every year. By "written down to zero," we mean that the asset is assumed to have no value at the end of five years. Depreciation is discussed in more detail in Chapter 10. The U.S. Securities and Exchange Commission (SEC) requires that most public companies file regular reports, including annual and quarterly financial statements. 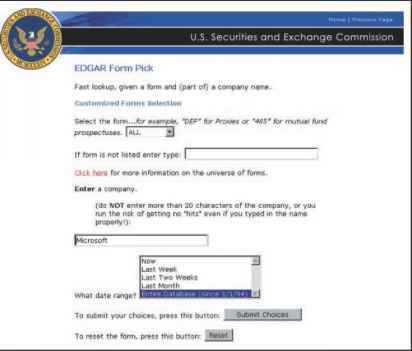 The SEC has a public site named EDGAR that makes these reports available free at www.sec.gov. We went to "Search EDGAR," "Quick Forms Lookup," and entered "Microsoft:"
As of the date of this search, EDGAR had 195 corporate filings by Microsoft available for download. The 10-K is the annual report filed with the SEC. It includes, among other things, the list of officers and their salaries, financial statements for the previous fiscal year, and an explanation by the company for the financial results. Product costs include such things as raw materials, direct labor expense, and manufacturing overhead. These are reported on the income statement as costs of goods sold, but they include both fixed and variable costs. Similarly, period costs are incurred during a particular time period and might be reported as selling, general, and administrative expenses. Once again, some of these period costs may be fixed and others may be variable. The company president's salary, for example, is a period cost and is probably fixed, at least in the short run. The balance sheets and income statement we have been using thus far are hypothetical. Our nearby Work the Web box shows how to find actual balance sheets and income statements on-line for almost any company.